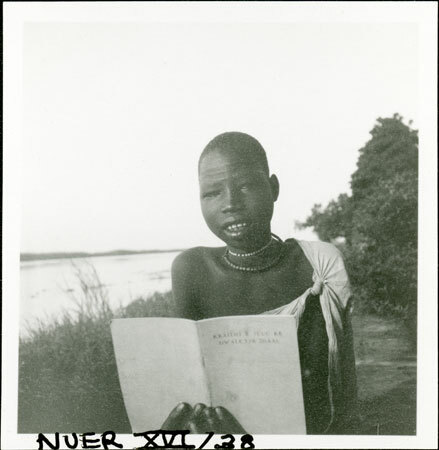 A portrait of a seated initiated youth reading a book (with Nuer title, probably new testament), photographed next to the Sobat at the American Presbytarian Mission at Nasir. Evans-Pritchard visited the mission in both 1931 and 1935 and dedicated his Nuer monograph to the staff there in gratitude for their help during his fieldwork. The curiously posed nature of the photograph suggests that Evans-Pritchard wished to obtain images of the efforts toward literacy undertaken by the mission school. Note on print reverse ms pencil - "28 A220" & print front border ms ink - "NUER XVI/38"
Morton, Chris. "Nuer youth at mission" Southern Sudan Project (in development). 03 Jan. 2006. Pitt Rivers Museum. <http://southernsudan.prm.ox.ac.uk/details/1998.355.770.2/>.